Happy Spring! All but a week ago, I was saying that I wasn’t ready to think about Spring recipes yet. And then the temperature popped up over 50 and the sun came out and 5 minutes later I was all Asparagus this! Lemon that! 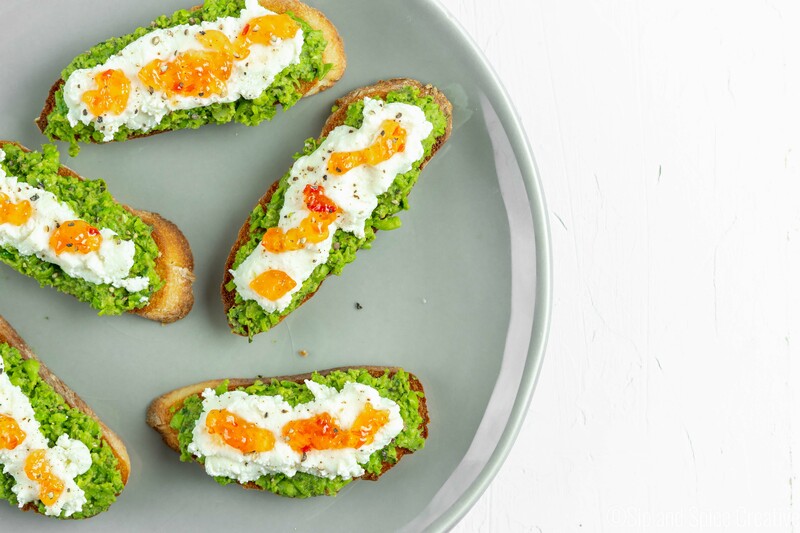 Pea Pesto Crostini with Ricotta and Red Pepper Jelly these! 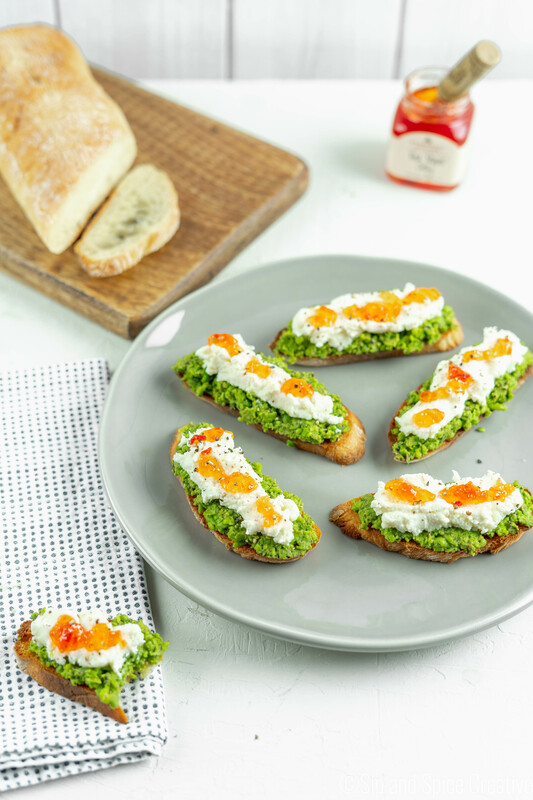 These Pea Pesto Crostini are the perfect thing to serve as a light appetizer for a cocktail party or for Easter brunch! They’re super bright and fresh with just enough kick from the pepper jelly to balance out the sweet peas. And such a lovely shade of green to boot! Nothing says Spring like a light green toast. They require just a handful of ingredients and take just a few minutes to put together. You could even prep the components in advance, then just put the crostini together shortly before serving. 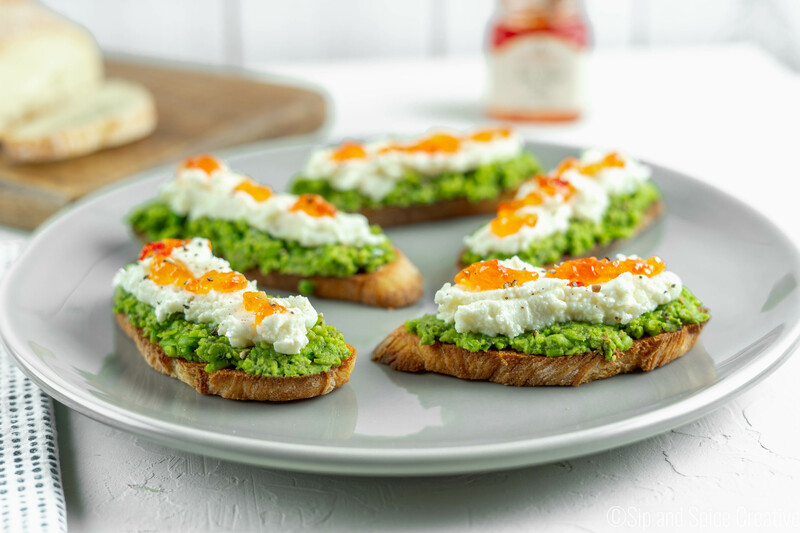 What makes these Pea Pesto Crostini with Ricotta and Red Pepper Jelly so fun is the combination of the garlicky pesto, the sweet peas and the slight spice of the red pepper jelly. Plus the ricotta adds a lovely element of creaminess. Defrost the peas to room temperature or steam to just unfrozen. In a food processor, combine the defrosted peas, pesto, olive oil, lemon juice, salt, black pepper, garlic powder and Italian seasoning. Pulse until just combined and the peas still have a bit of texture. Prep the ciabatta slices with the olive oil spray on both sides (or brush each side with olive oil), then toast or broil until just browned, flip and finish for another 2 minutes. Remove from the oven and let cool. 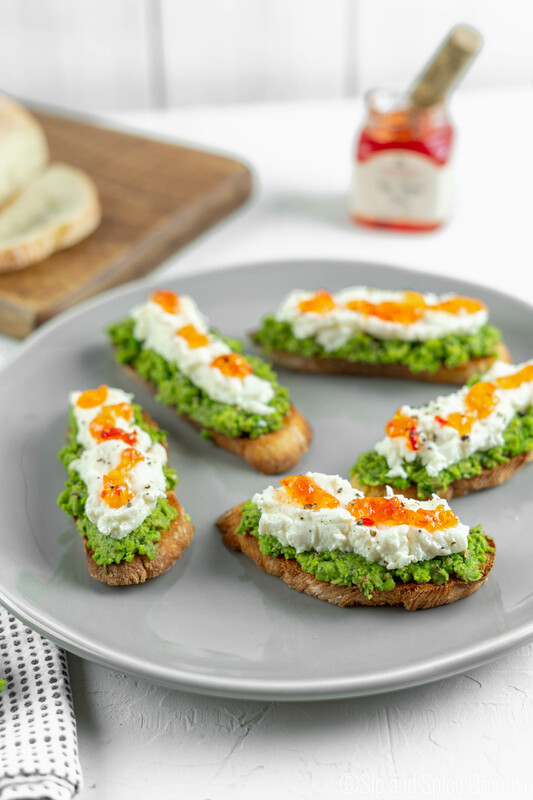 To make the crostini, spread the pea pesto mixture, then top with a dollop of ricotta and a bit of pepper jelly. Then sprinkle with black pepper, sea salt and crushed red pepper flakes, if desired!